Tef (Eragrostis tef (Zuccagni) Trotter) is a dual purpose cereal, valued for both grain and forage production in dry areas with a short rainy season. Tef grain is a staple food in Ethiopia and tef straw, the main by-product of tef grain production, is a basal component of livestock diets in this country. Since the late 1990s, the recognition of tef as a gluten-free cereal of good nutritional value has resulted in new found interest, particularly in industrialised countries (Baye, 2015). Both tef grain and tef straw are described in separate datasheets. 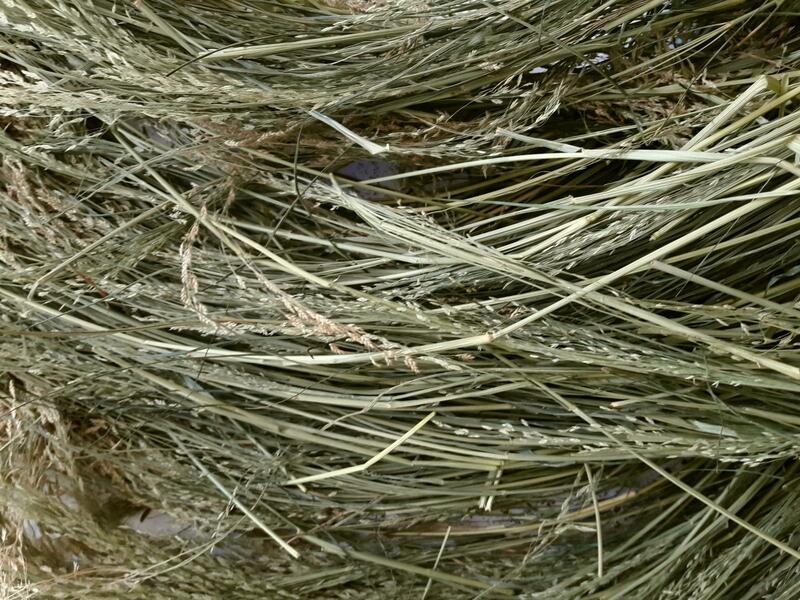 Tef is one of the fastest growing hay crops known, valued for its high yields and high quality. It is considered an emergency forage in drought prone areas (Miller, 2010; FAO, 2016). The use of tef for forage began in the late 19th century in South Africa during the Boer War, where it was used to feed horses and oxen (NRC, 1996). 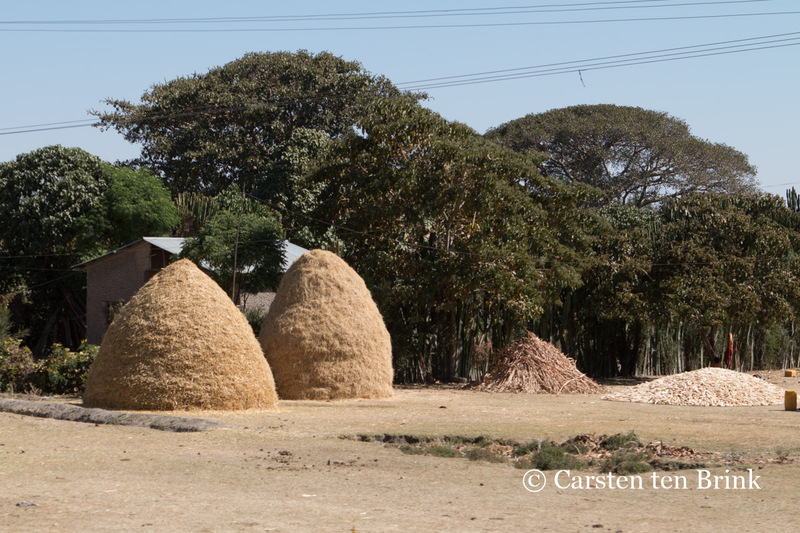 Today, while rarely grown specifically for forage in Ethiopia, tef is cultivated for hay in other countries, notably South Africa, Australia and the USA (Baye, 2015). 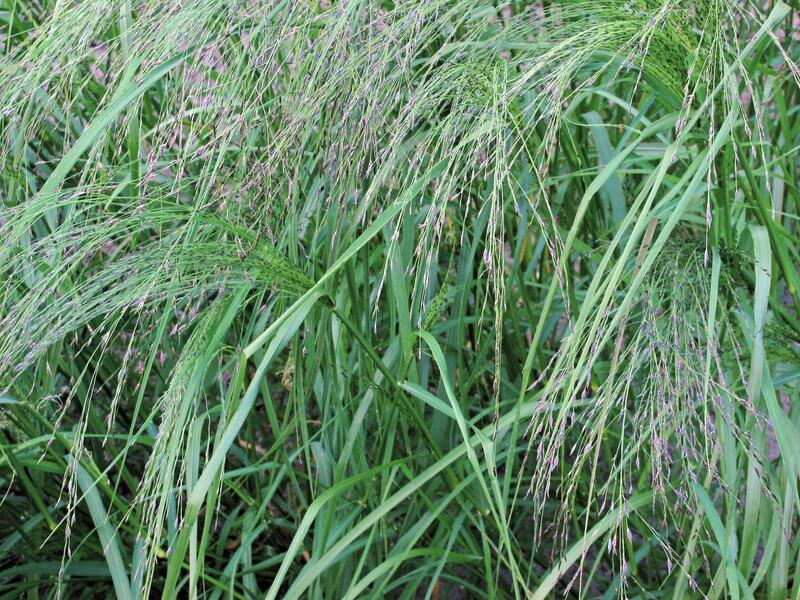 Tef is an annual, leafy, tufted grass that reaches a height of 150-200 cm at maturity. The culms are fine, erect, simple or sparsely branched, prone to lodging. The root system is shallow and fibrous. Tef is a leafy species. Its leaves are glabrous, linear, 25-45 cm long x 0.1-0.5 cm wide. The seed head is a long panicle, 10-65 cm in length, bearing 10-40 slender racemes, which may be either very loose or very compact. Panicles bear 30-1100 spikelets. Fruits are ellipsoid, minute (1-1.5 mm x 0.5-1 mm), yellowish-white to deep brown caryopsis (grain) (Tefera et al., 2006; Seyfu Ketema, 1997). Tef forage, as pasture, hay or silage, is a highly valued forage, known since the late 19th century for its palatability, high nutritive value, high yield, rapid growth, drought resistance and ability to smother weeds (Seyfu Ketema, 1997). Tef may also be used as an ornamental grass (Tefera et al., 2006). Two ecotypes of tef are cultivated in Ethiopia. The Hagaiz type has white seeds, matures slowly (150 days), makes higher demands on soil and cannot be grown above an altitude of 2500 m. The Tseddia type has brown seeds, matures early (90 days), can be grown above 2500 m and is superior for fodder production (NRC, 1996). In the USA, tef is subjected to breeding programmes in order to improve frost tolerance. While primarily fed to horses in this country, tef forage also shows potential for all classes of ruminants (Miller, 2010). Tef is thought to have originated in Ethiopia, where it started to be used as a food grain between 4000 and 1000 BCE. It is mainly cultivated in its native range (Ethiopia and the highlands of Eritrea) and in neighbouring Northern Kenya. In the tropics, tef is particularly suited for altitudes ranging from 1300-2800 m, but it can grow from sea level up to an altitude of 3400 m. Only brown/red tef is grown above 2500 m. Tef is particularly valued in areas too cold for sorghum or maize, and it can be found where temperatures as low as -15°C occur, provided the frost is of short duration (NRC, 1996). In Ethiopia, tef grows where annual rainfall ranges between 950-1500 mm, with about 450-550 mm during the growing season (Tefera et al., 2006). Tef cannot withstand more than 2 500 mm rainfall. However, tef can adapt to growing conditions ranging from drought to waterlogging, and is able to withstand wet conditions, perhaps better than any cereal other than rice. Tef is mainly grown on sandy loams, but it can grow on black, heavy clay soils (black cotton soils) provided they are well drained and have sufficient N. Neutral or slightly acidic soils are preferred (Tefera et al., 2006). Tef can withstand as much or more salinity than alfalfa (Miller, 2010). A C4 plant, tef makes efficient use of water and heat. It can grow in areas prone to drought after short rains (Tefera et al., 2006). There have been many attempts since the mid-19th century to introduce tef into the Americas, Asia, Australia and the Middle-East. Initially tef cultivation only took off in South Africa, where it was the main hay crop as early as 1936 (Kassier, 2002). However, since the late 20th century, tef has been grown in South Africa, the USA, Canada, Australia, the Netherlands and Yemen for small-scale production of gluten-free grain. Its potential for forage production has been investigated and resulted in the production of several new improved forage-types in recent years. Tef is grown for forage in Morocco, South Africa, Australia, India and Pakistan as well as in the USA (Miller, 2010; Tefera et al., 2006). In the USA 100,000 ha of tef were harvested in 2008-2009 (Miller, 2010). Tef is propagated through seeds and should be used in sole cropping systems as it does not withstand intercropping (Ecocrop, 2016). In Ethiopia, tef is commonly grown in rotation with cereals, pulses and niger (Tefera et al., 2006). Tef requires a weeded, well-prepared, firm seed-bed. It can be planted, broadcast or sown at 15-20 kg/ha in rows, no deeper than 1 cm, and subsequently rolled (Ecocrop, 2016; Tefera et al., 2006). It must be regularly weeded. N fertilizer should be provided in small amounts, or tef should be sown after an N-legume in order to reduce the risk of lodging. Tef requires little care after establishment. Its rapid growth outcompetes weeds. It is subject to few diseases and pest attacks. In Yemen, it is considered a "lazy man's crop" as it does not require any care between sowing after flash flooding and harvesting (NRC, 1996). The major limitation of tef in terms of forage production is lodging, particularly when the plant reaches the flowering stage, or when high rainfall and strong winds occur at maturity. Excessive nitrogen fertilisation also encourages lodging. Lodged tef grass is very difficult to cut, and wastage occurs (Kassier, 2002). Tef is known as an emergency crop: it can be planted late in the spring when the growing season is warmer and harsh conditions occur. Farmers can still sow tef when their other crops are failing. Then it can be cut several times during the hot summer months to provide forage during the feed gap, or it can be stored for further use during winter. Tef can also be sown to provide forage after a wheat crop has been harvested (Miller, 2010). Tef forage is easy and cheap to grow, and quick to harvest. Tef grows best when it is sown in pure stands. However, though tef does not do as well in mixture with other forage new plantings, it can be intersown into old alfalfa stands to enhance forage production (Miller, 2010). In Ethiopia, when tef is intended for hay, it can be harvested 9-12 weeks after sowing (Tefera et al., 2006). In the USA, tef is cut at the early boot stage, between 45 and 55 days after sowing. Tef may be cut once or several times, a second cut being done only 28-35 days after the first one so that seed head formation is avoided (Miller, 2010). Tef forage is generally used to make hay but it can also be grazed or ensiled (Miller, 2010). In Ethiopia, tef was reported to yield 14-14.5 t green matter/ha (Tedesse, 1969 cited by Alemayehu Refera, 2001). In the USA, forage yield was about 4-6 t DM/ha in just 45-55 days. In South Africa, yields of 3.8-4.7 t DM/ha have been obtained for late November and December plantings, and maximum yields of 7.6-9.4 t DM/ha were obtained for September and October plantings (Kassier, 2002). Tef can serve as temporary ground cover. Its very fast germination and fibrous root system development make it an excellent choice for erosion control (Miller, 2010). In South Africa, it could be used as a "nurse crop", quickly covering the ground and fostering the establishment of perennial grasses sown along with it. It has been used in mixtures to protect road cuts, open-cast mine workings, stream banks, and other erodible sites (NRC, 1996). Tef may be a valuable rotation break in perennial grass pasture or in old alfalfa stands. Its fast-growing habit makes it aggressive to weeds. In Ethiopia, tef is often used to reduce weed pressure in successive crops (Miller, 2010). The nutritive value of tef hay, though highly variable, can be quite high when cut young. In a survey of 4 cultivars in Oregon, USA, tef forage cut at seed-head emergence had a protein content averaging 16.3% of DM at the first cut (11.0-19.4%), and 13.3% of DM at the second cut (10.9-15.4%) (Roseberg et al., 2007). Quality decreases rapidly after the boot stage: another trial in the USA showed that protein content decreased from 16.4% (boot, 14 July) to 7.5% (late heading, 11 August) (Staniar et al., 2010). In South Africa, protein values as low as 5% of DM have been reported, barely above that of tef straw (Erasmus et al., 1990). A reduction with increasing maturity from 12.1% (early bloom) to 8.6% (full bloom) was also reported (Kassier, 2002). The fibre content is relatively low compared to other tropical grasses (NDF 51-68% of DM, lignin less than 5% of DM). This reflects the general leafiness of tef, which is often compared to timothy grass (Phleum pratense) in the USA (Miller, 2010). No antinutritional factors or toxic compounds, such as nitrates or hydrogen cyanide, generally associated with other annual summer species, have been reported in tef forage. Tef forage is fine stemmed, leafy and “soft”, and is then very palatable to livestock. Tef hay quality is reported to be so high that South African farmers prefer it over all other hays for feeding their dairy cattle, sheep, and horses (NRC, 1996). In the USA, tef hay is considered a premium quality hay for horses, dairy and beef cattle, and also sheep (Miller, 2010). While there has been the conception that tef is not suitable for grazing purposes, dairy farmers in South Africa have been utilizing tef as a grazing pasture for the late summer and early autumn period, in order to fill the gap between successive ryegrass (Lolium multiflorum) pastures (Kassier, 2002). Tef hay has a high palatability. It was reported to be preferred over alfalfa by dairy cows, in Idaho, USA (Miller, 2010). In the USA, in vitro DM digestibility values ranged between 59 and 65% (Boe et al., 1986). In South Africa, the protein degradability of tef hay was reported to be among the lowest (44%) of 12 other roughages. Treatment with ammonia increased protein degradability up to 74%, but it remained lower than for alfalfa hay (84%). However, it should be noted that the tef hay used in that study had a very low protein content (5% DM) and was closer to tef straw than to the tef hays usually considered (Erasmus et al., 1990). In Utah, USA, rations containing either alfalfa or tef hay were calculated to meet the requirements of 12 growing beef steers and 12 dairy heifers. The tef hay based diet for steers included 44% tef hay and 21% maize silage, and the diet for heifers included 8.5% alfalfa hay, 42% tef hay and 11.3% maize silage. Tef hay based rations resulted in higher DM intake than alfalfa hay based diet in both steers and heifers. Tef hay had no effect on the growth of the steers but DWG of the heifers increased significantly. Tef hay was assessed as cost effective for beef steers and heifers (Young, 2014). These results were in line with the observation that tef hay meets the requirements of growing heifers if they are supplemented with grain (Lindquist, 2014). Tef hay was also reported to meet the requirements of dry cows (Lindquist, 2014). Varieties of tef forage with a relatively low copper content are available, making it a suitable forage for sheep (Miller, 2010). No publications are available in the international literature regarding tef straw in rabbit feeding (as of 2016). Because tef straw is widely used in ruminant feeding as the main feed, it should be safe to feed to rabbits. Tef hay is a low protein forage with a very high NDF content, which resembles tef straw rather than legume hays. The calculated digestible energy is 7.2 MJ/kcal DM, i.e about 1 MJ lower than that of alfalfa hay (Lebas, 2016). Tef hay should be considered as a low energy and low protein forage, and mainly as a source of fibre. It should be noted that tef hay protein is deficient in lysine and covers only 70% of the recommendations for rabbits (Lebas, 2013). Tef hay is widely used as a source of roughage for horses in South Africa (Niekerk et al., 1997). Tef hay is marketed in the USA as a ‘preserved forage’ appropriate for horses, with a nutritive value comparable to that of timothy hay (Miller, 2010). Early-heading tef hay offered the best balance between providing a palatable and digestible nutrient source for the horse and a productive forage crop (Staniar et al., 2010). According to their owners, horses stayed healthier and maintained the proper stage of body condition when fed tef hay (Lindquist, 2014). Tef hay cut at an early stage of maturity was reported to be as palatable (similar voluntary intake) as timothy in mares, provided the animals could get used to it or had no choice (McCown et al., 2012). Horses fed on tef hay based diets had a lower crude protein (CP) intake than horses fed on alfalfa hay. This could be due to the lower CP content of tef hay combined with lower digestibility of CP (Niekerk et al., 1997). The low contents in energy and non-structural carbohydrates make it a potentially beneficial forage choice for overweight horses, those with equine metabolic syndrome, or those prone to laminitis (Staniar et al., 2010). Though considered a reference feed for horses in South Africa, tef hay based diets provide half the digestible threonine, isoleucine, leucine, lysine and arginine of alfalfa based diets (Niekerk et al., 1997). Lyddon, C., 2015. Focus on Ethiopia. World Grain, Sosland Publ. Co.
Twidwell, E. K.; Boe, A. ; Casper, D. P., 1991. Teff: a new annual forage grass for South Dakota. ExEx 8071. Coop. Ext. Serv. South Dakota State Univ. Brookings, SD.